The three different types of mushrooms in our recipe provide all the flavour you will ever need in a paella. As a nod to appearance we add red bell pepper squares which bring the dish to life. Mushrooms are very popular in may areas of Spain and locals gather them from the woods and forests for their own consumption. Many mushrooms however are cultivated and sold in the many markets around Spain. The trick with buying mushrooms in shops and markets is to ignore any specific variety, simply choose the ones which look the freshest. We chose chestnut, shiitake and simple large cup mushrooms. Some mushrooms are sold as dried and need to be soaked in water before use. Many consider these sun dried mushrooms to have a superior flavour compared to fresh mushrooms. Whatever mushrooms you choose, try to select three different varieties to give different textures and appearances. 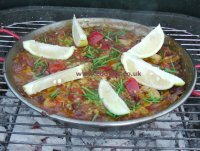 To find out more about the general principles behind a good paella, click here for lots more information, hints and tips. 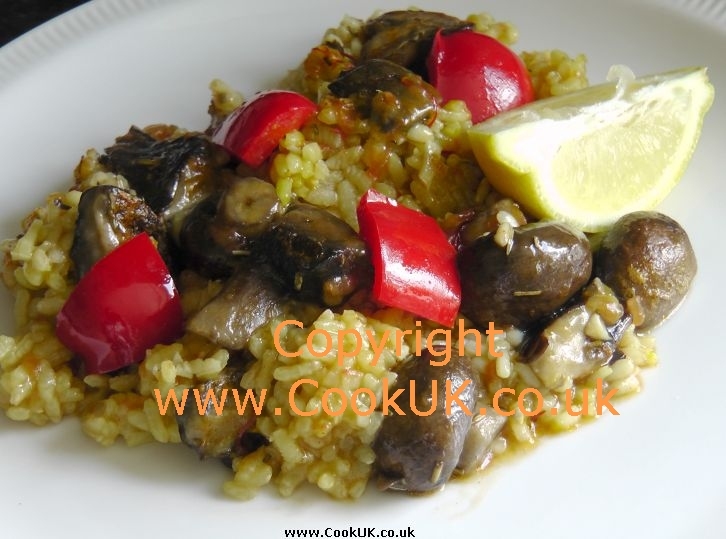 This mushroom paella recipe assumes you will be cooking on the hob of your cooker, not the ideal for a perfect paella but it works well. You will need to fry off the mushrooms and sweet (bell) peppers in a pan anyway. The stock in this recipe is slightly less than some other paella recipes. In part this is due to the liquid from the mushrooms but we also suspect that cooking on the hob is the reason. Possibly less liquid evaporates during the cooking process. 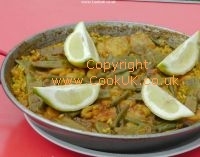 A 30cm / 12im paella pan or large frying pan - see here for dimensions. 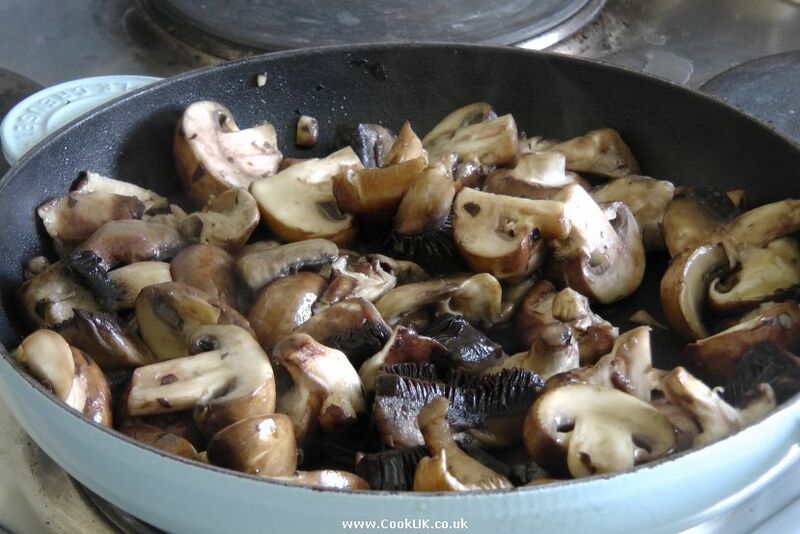 We wash our mushrooms in a bowl of cold water and suggest you do the same. Some claim this impairs the taste of the mushrooms but take one look at the water after you have washed the mushrooms and then decide for yourself! Chop the mushrooms very roughly (see video or pictures below for an idea of the size needed). De-seed and grate the flesh of the tomatoes (see the video below for more details). Top and tail the garlic then remove the skin and finely chop. Cut the sweet red peppers in half, remove the seeds and white pith. Cut the red pepperds into rough 3cm / 1in squares. Heat the pan on a medium heat with two and a half teaspoons of the olive oil. Add the mushrooms and a couple of pinches of salt and stir well. Cook for five minutes then turn the heat up to medium hot and cook for two more minutes. Put the fried mushrooms, with any liquid in the pan, into a bowl for later use. Add one and a half tablespoons of olive oil to the pan on a medium heat and then add the red pepper squares. Cook for five minutes or so turning the sweet pepper squares frequently. Place the fried red peppers in a bowl for later use. With the pan on a medium heat add two tablespoons of the olive oil. 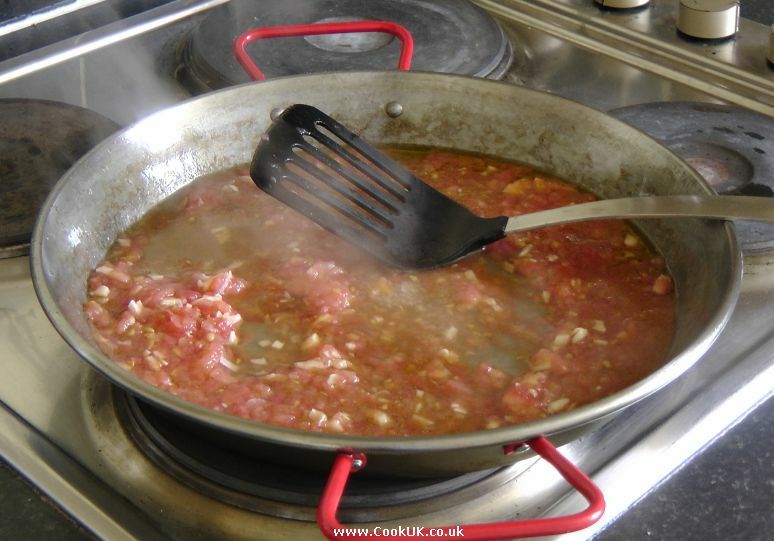 Pour in the tomatoes and garlic then mix well. Cook for ten minutes at a simmer. 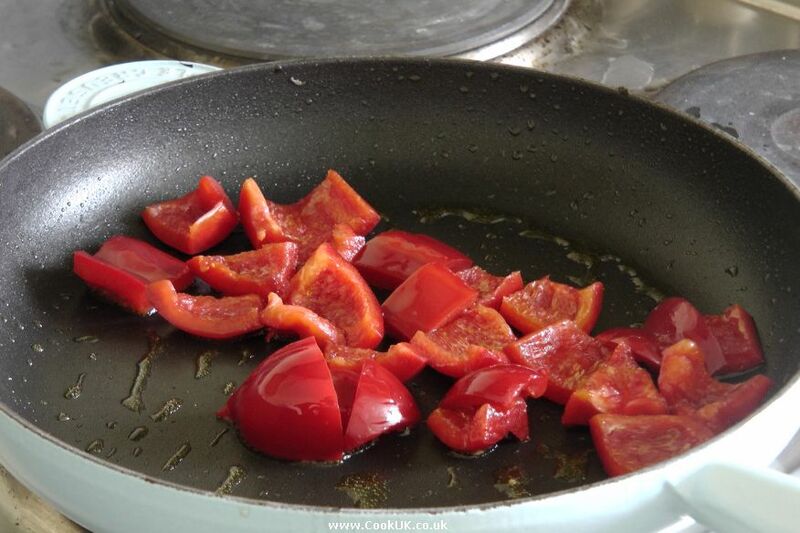 Add the saffron, rosemary and sweet paprika to the tomatoes and garlic in the pan. Stir well for a minute or so. Add the stock to the pan then the rice. Settle the rice evenly to the bottom of the pan with a spoon. Turn the heat up so that the mixture is lightly boiling. 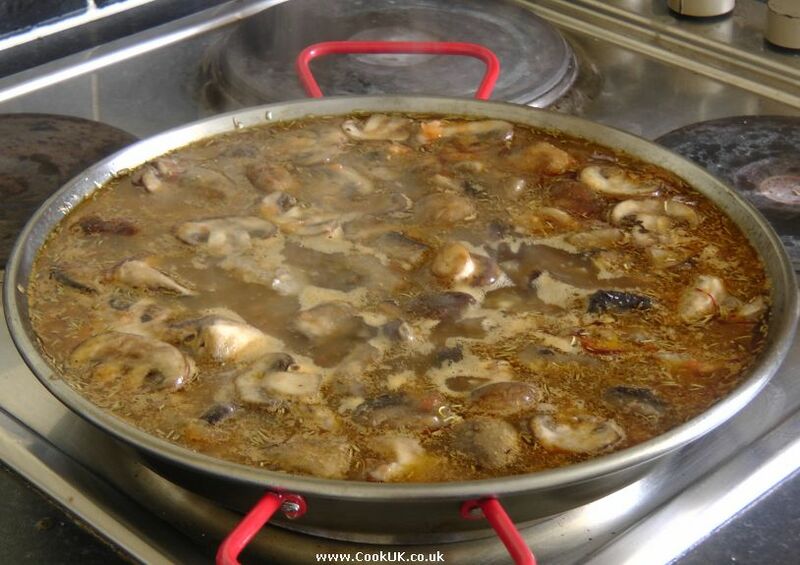 Add the mushrooms and any mushroom liquid to the paella mixture. Cook for ten minutes then turn the heat down and cook for eight minutes more at a a simmer. Add the sweet pepper squares and then remove the paella from the heat, cover with foil and allow it to rest for five minutes. Decorate with the quartered lemon pieces and eat immediately. 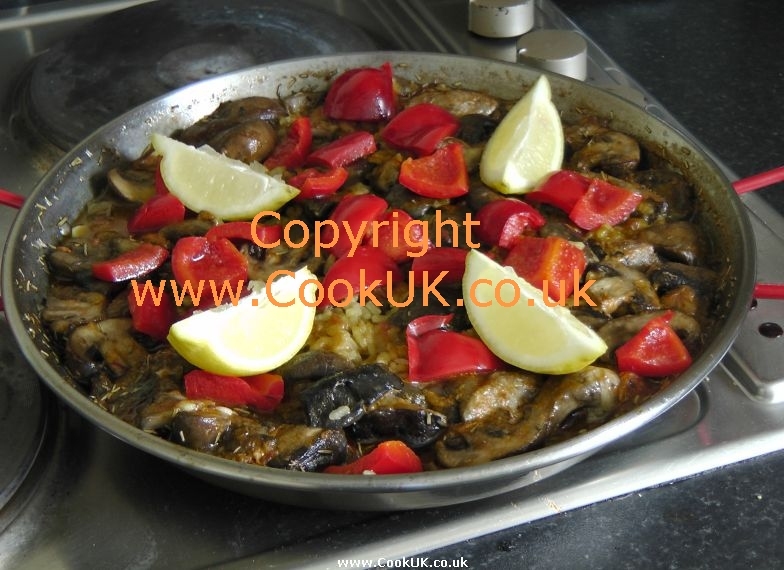 ADD YOUR COMMENTS AND RATING BELOW ABOUT THIS MUSHROOM PAELLA RECIPE. THEY WILL BE ADDED ABOVE WITHIN 12 HOURS.